1. Distinguishing between retinal detachment and posterior vitreous detachment should be done with an abundance of caution since accuracy is not perfect and these pathologies can occur simultaneously. 2. In comparison to posterior vitreous detachment, retinal detachment is more hyperechoic, less mobile, and tethered to the optic nerve. Point of care ultrasound can be used to find a variety of ocular pathologies. Therefore, it can be a helpful tool in differentiating between the causes of acute visual complaints. Retinal detachment (RD) and posterior vitreous detachment (PVD) are two pathologies often on the differential. Retinal detachment is usually the more emergent condition, sometimes requiring surgery. Generally, many practitioners will rely on an ophthalmologist's dilated fundoscopic exam to get an answer. It would certainly be nice if ultrasound could distinguish these, but unfortunately, the sonographic appearance can be similar. This study investigates whether emergency physicians can reliably distinguish these pathologies on ultrasound. Can emergency physicians accurately differentiate between retinal detachment and posterior vitreous detachment on point of care ocular ultrasound? Physicians given pre-recorded clips of ocular ultrasound and asked to identify pathology. Percentage correct was the primary outcome. There were a total of 30 different ultrasound clips: 14 showing PVD, 13 showing RD, and 3 that were normal ocular ultrasounds. These clips were verified by ultrasound experts to to show the pathology that was confirmed by the final diagnosis made by ophthalmologists. Each physician received a clinical scenario (taken from actual emergency department patients) and was then presented with an ocular ultrasound clip. 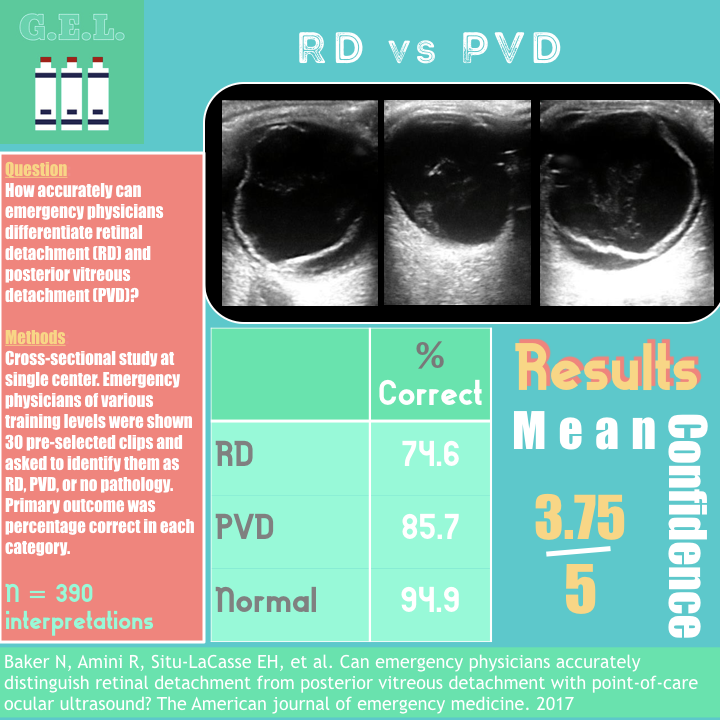 RD can be slightly more echogenic than PVD. However, the key to differentiating between the two is to identify the optic nerve first. RDs will remain attached to the optic nerve sheath, whereas PVDs will cross over the midline, hence, also crossing over the optic nerve. RD is not so mobile with eye movements, unlike PVD, which is very mobile with eye movements. Generally, RD has same thickness throughout, unlike PVD, which has varying degrees of thickness. The average physician's confidence score was 3.75 (SD 0.48). There was no significant difference in accuracy or confidence when stratified by POCUS experience or clinical experience (attending vs fellow vs resident). These were pre-recorded clips and therefore, this is assessing interpretation only. Participants were only given a single clip per patient - maybe accuracy would have improved if they could see pathology in multiple planes or were performing the scan themselves. 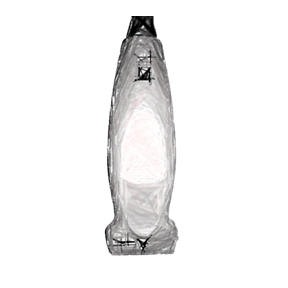 On the other hand, since the experience was variable, maybe performing the scans would have decreased their accuracy. Likewise, the accuracies found in this study do not reflect the accuracy of the ultrasound for these pathologies. This was not a comparison of ultrasound to a gold standard, but rather a measurement of how well a population can interpret ultrasounds. Selection bias - participants who wanted to be involved could have been better at ocular ultrasound. PVD can cause RD. There were no scans included that had both pathologies. In this 2016 study we reviewed there were a number of retinal tears that were missed. Most were misdiagnosed as PVD. Are the findings of this study going to change your practice regarding how you manage the patient in front of you? Whether or not you get an ophthalmologist involved? Probably not. This is just telling us how well one population interpreted these findings, but again, this does not necessary correlate to the accuracy of someone performing the exam on a real patient. This just brings to light a potential difficulty in distinguishing between two different pathologies that we should be aware of if we intend to use POCUS for these diagnoses.